The first page is repeated. I do like that despite everything future-Tim still has a Nightwing fixation given the design of his outfit. 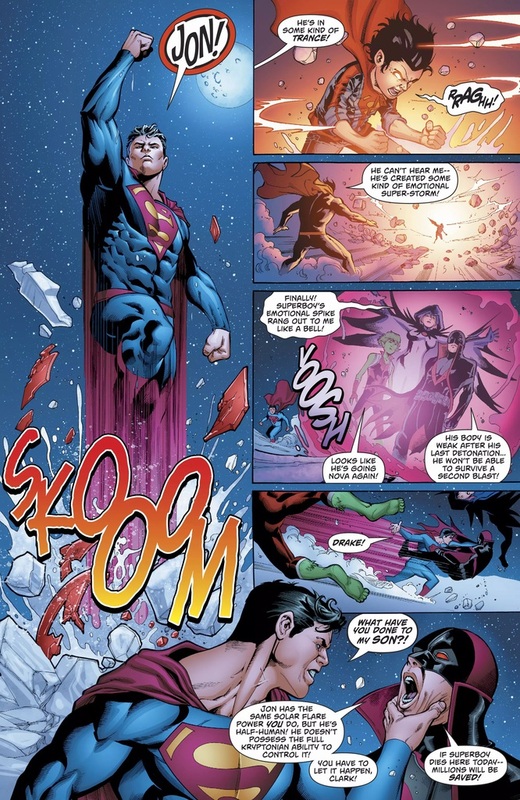 Crazy future Tim Drake came back in time and tried to kill Jon because, in his timeline, Jon suffered a Solar Flare that killed him and millions of people. 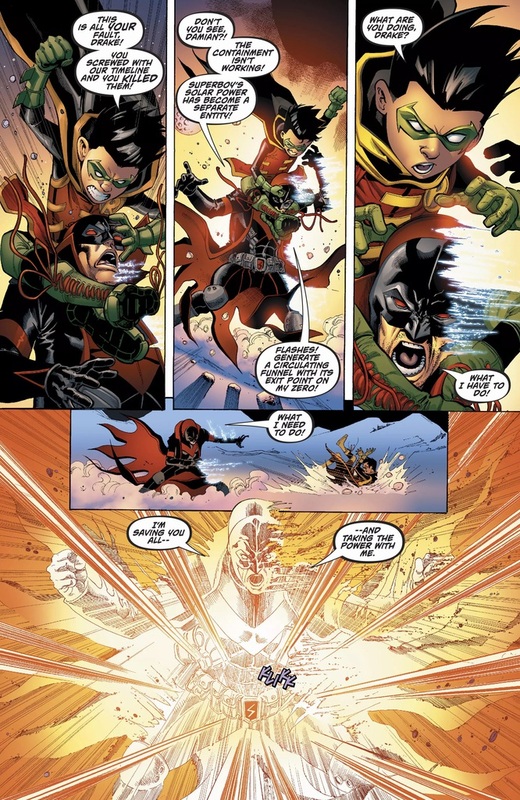 When confronted the teen titans about it, Tim managed to convince Raven and Beast Boy to join him in restraining Tim while Kid Flash, Aqualad and Starfire sided with Jon and Damian. Meanwhile, Future Connor, Cassie and Bart came to bring Tim back to their time and help him, but came right when Jon was suffering the solar flare that would kill him so they join forces to save Jon. Is there still a present Bart in this timeline? I've got completely lost. There was Bar-Torr who disappeared in the middle of an issue of the last Teen Titans run. Thankfully he hasn't really been mentioned since. He didn't and we do. 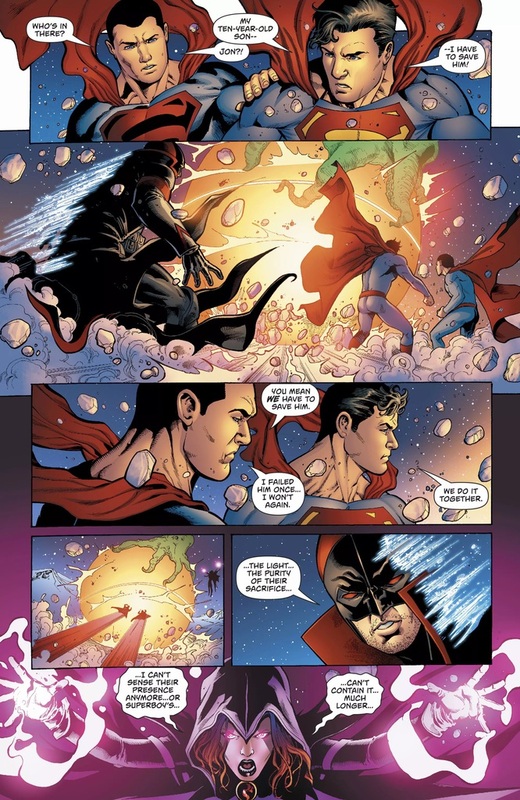 Ever since pre-Flashpoint Superman merged with nu52 Superman and we got a consolidated Superman history, they've been lowkey ignoring the existence of both pre-Flashpoint and post-Flashpoint Conner. 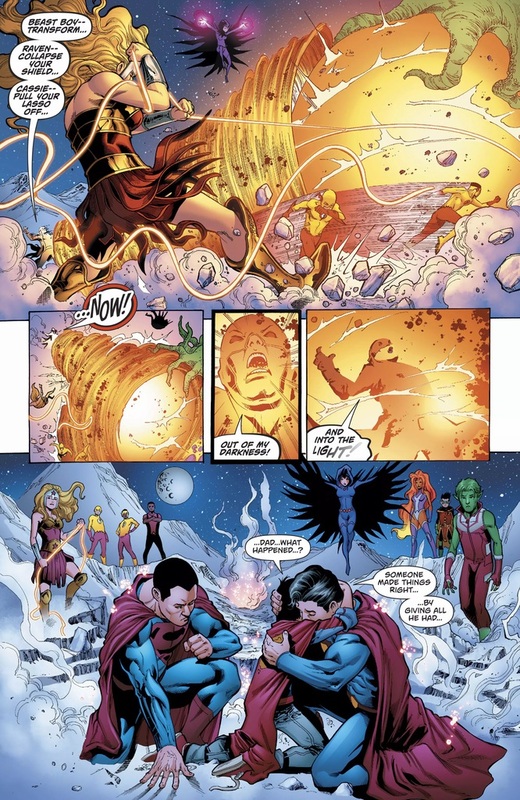 Reign of the Supermen still happened but noticeably without Superboy. And Titans Tomorrow Tim mentioned Conner to current day Tim who didn't recognize the name, so apparently he doesn't remember nu52 Superboy either. Furthermore Superman and the Teen Titans don't seem to recognize Conner, Cassie or Bart here. Tim didn't recognise Connor's name, but he did say it got some reaction from him. The titans tomorrow verse is a mediocre idea that they just keep getting mileage out of. I mean its not even a particularly good or innovative alt-future. I think it helps that their backstory and details continue to shift with each appearance. They're usually from a bad or unpleasant future, but often end up changing things for the better. They were pretty good in their introductory story. But the reason they worked at the time is because they also informed the Teen Titans characters and their character development in the book. They weren't just a group of bad buys. Their appearance hinted at where Tim, Conner, etc might go or how they want to avoid becoming that. Any subsequent appearances, though, quickly became a case of diminishing returns.